The DeWALT USB Charging Roller Bag features a USB charging battery dock that simultaneously charges 2 devices via USB ports with a maximum 2 Amps shared output. There are 3 Internal charging wall pockets that can hold a tablet, phone, and/or camera and can charge 2 devices through a USB connection to a 20V MAX* Lithium battery pack. It features a large, sturdy telescoping handle that extends for fast transport of heavy loads. The heavy-duty treaded wheels allow for easy bag movement over rough terrain. The magnetic folding zipper top conveniently attaches to the telescoping handle for full access to main compartment. The large interior holds most large power tools and accessories. There are 10 multi-use pockets inside and 13 outside to help organize a wide variety of hand tools and padded web carrying handles. The Kuny's Lighted Roller Tool Bag features a telescoping LED lighted handle which can be easily directed at the work area or into tool carrier to help identify tools and parts. There are 3 levels of light output that allow adjustment for wide area illumination or close-up work. The sturdy telescoping handle extends for fast transport of heavy loads. There are 6 multi-use pockets inside and 11 outside to help organize a wide variety of hand tools and the heavy-duty treaded wheels allow for easy bag movement over rough terrain. The magnetic folding zipper top conveniently attaches to the telescoping handle for full access to the main compartment. The large interior holds most large power tools and accessories and can also be carried by the padded web carrying handles. 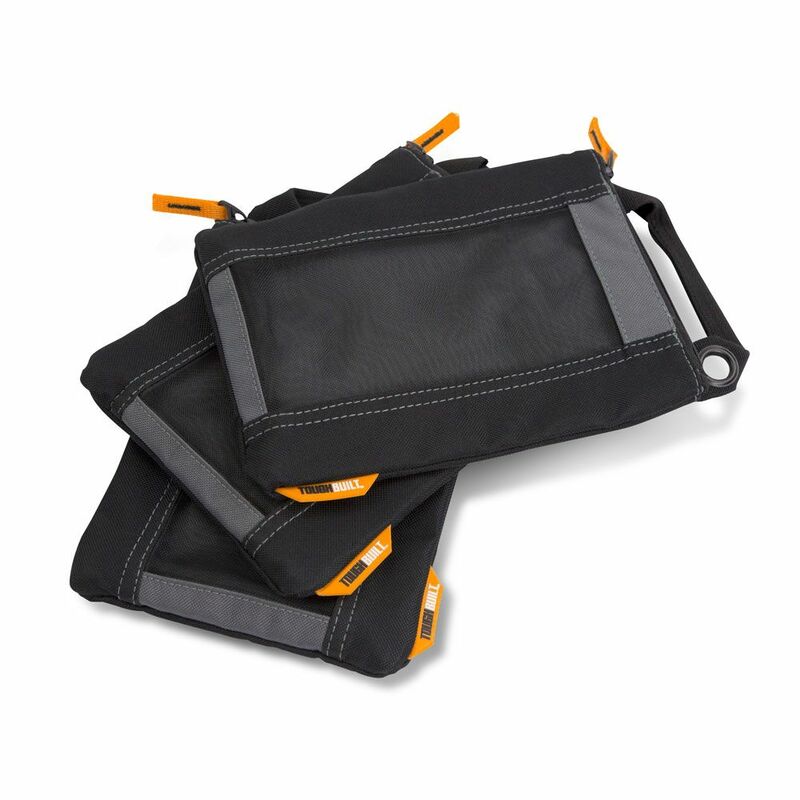 3 Pack - Fastener Bags The ToughBuilt Fastener Bag 3-Pack simplifies storage of supplies. Heavy-duty mesh windows all ow you to see everything inside making organization simple. Features hanging grommets and convenient carry straps. Wide, top-mounted zippered openings allow easy access. Made with heavy-duty materials and construction, these Fastener Bags withstand the most rigorous work environments.